Wyoming County Commissioners (back, left) Tom Henry, (back, from right) Ron Williams and Judy Mead issued a proclamation congratulating the Tunkhannock Tiger Boys Cross Country Team for an outstanding season capped by the school’s first Class AA PIAA State Championship in 41 years. The team was represented by (seated, from left) Joey Moffet, John Loomis, Ben Siegel, Carson Ayers, (standing, continuing from left) Assistant Coach Doug Wilson, Jacob Toczko, Justin Stonier, Jack Tidball, Alan Grow, and Coach Randy White. The agenda for the Nov. 19 meeting of the Wyoming County Commissioners was full to overflowing. In addition to some of the more serious business matters at hand, such as the annual budget and fact that three county municipalities do not yet have confirmed tax collectors, the commissioners took time to congratulate the Tunkhannock Area High School Boys Cross Country Team. The meeting was disrupted briefly as photographers jockeyed for photos of the 2013 AA PIAA State Champions, prompting Commissioner Judy Mead to remark, “That’s always nice to see,” as the stand-out students filed out of the meeting room with coaches Randy White and Doug Wilson to return to school. The commissioners then heard from County Planning Director Nicole Wootten and agreed to tentatively approve the hiring of a consultant to produce a new Comprehensive Plan for Wyoming County. The current plan has not been updated since 1977 to reflect the changes in land use brought about by the shale gas industry. Wootten was assisted by Northern Tier Planning and Development Commission program manager Rachel Hauser in narrowing a field of seven proposals for a consultant down to two. Wootten related that she will bring the topic up to discussion at the monthly Wyoming County Planning Commission meeting to be held on Wednesday evening at the county’s Emergency Management Agency headquarters on Route 6 east of Tunkhannock at 7 p.m.
She noted that she was also working with the Wyoming County Chamber of Commerce to try to find a consultant who was familiar with local issues. “There are so many conditions that are unique to the county,” she stated in reference to the energy industry. The Chamber will help as well by submitting an economic development study that will become part of the overall plan. Given the time frame between Wednesday evening’s meeting and the next commissioners’ on Tuesday, Dec. 3, the commissioners agreed with Wootten that they could keep the ball rolling by approving the proposal with a $50,000 cap on spending. Once an agreement is reached, the county will apply for matching funds from the state’s Municipal Assistance Program through the Department of Community and Economic Development. While acknowledging that the process will likely take another 18 months to bring fully to fruition, the commissioners are ready to take action. “The (current) plan is outdated,” said Commissioner Tom Henry. Chief Clerk William Gaylord related that he and Wootten were recently reviewing a county land-use map and found structures where there are now empty lots and vice versa. “The County is changing, and there’s areas that need to be protected,” Commissioner Ron Williams added. Gaylord related that municipalities are supposed to have a tax collector confirmed by Dec. 1. County Director of Elections Florence Ball said that each municipality has 30 days to file final election returns, which would be Dec. 5, so the tax collectors in the aforementioned municipalities could be confirmed among write-in votes in the meantime. Should any municipality not confirm a tax collector, Davis added, a statute in the state’s tax code referred to as Joint Tax Collection would allow for a neighboring municipality or the county to serve as tax collector. Remaining business matters to be discussed included an announcement that the Wyoming County Budget will be available for review by the public for 20 days beginning Dec. 5, and that Edwin Velez had been hired by the county as the new Deputy Sheriff. The board noted that Velez has been working part time with the Sheriff’s department before filling the vacant position. The commissioners also approved a $31,300 grant for the Victims Resource Center (VRC) of Wyoming County for the Stop Violence Against Women program. Board members agreed that the program and VRS representatives have been invaluable to victims of abuse by preparing women for trial and guiding them through the judicial process to seek restitution. Under “written communications,” Gaylord noted that an office of the state Supreme Court had sent a letter asking if the county had “duress alarms” at each of its district judges offices, which he then confirmed. Henry and Williams explained that the county had invested wisely in recent years in security enhancements at both district judges offices and at the courthouse. The upgraded systems include digital cameras, which produce quality images that allow for more accurate identification of would-be perpetrators. A new Cooper Notification System is being tested in the county to alert county employees in the event that the courthouse is closed for any reason, including bomb threats. Nonetheless, he added, county employees will be notified via text message of any such closure or issues at the courthouse, thus reducing the reliance on local television stations that may not transmit the crucial messages for 30 minutes or more. Williams spoke from the heart when he and fellow board members approved a proclamation acknowledging Wyoming County’s role in National Adoption Month. Williams and his wife have adopted six children. Also in attendance was Lori Bennett, who has adopted five children. Both expressed the challenges and rewards of adopting children. Other options include Subsidized Permanent Legal Custodianship (SPLC) and Another Planned Permanent Living Arrangement (APPLA), for which one other child in the county is currently eligible. 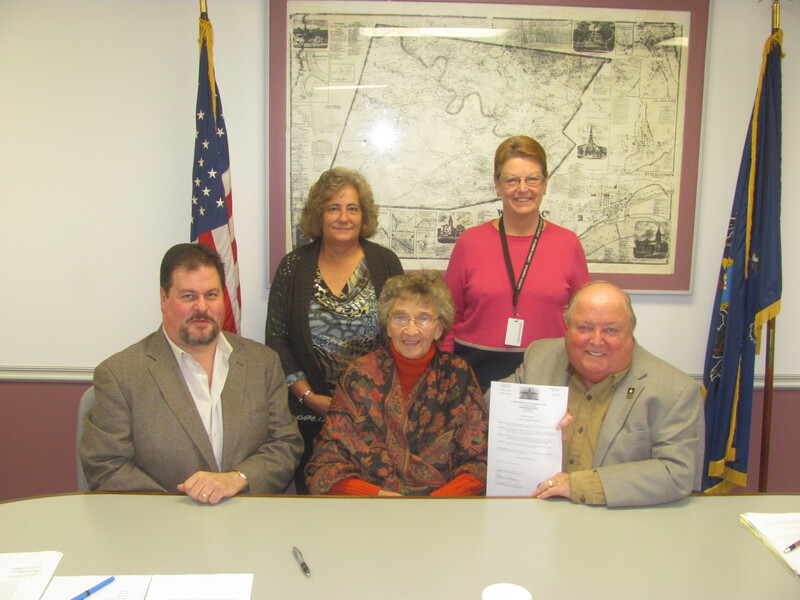 Wyoming County Commissioners (seated, from left) Tom Henry, Judy Mead, and Ron Williams, (back, left) adopting parent Lori Bennett and county Human Services Director Patty Skrynski marked National Adoption Month with a proclamation at the courthouse in Tunkhannock on Tuesday.